This heritage listed building is the Genesian Theatre, located along Kent Street. It was originally the St John The Evangelist Roman Catholic Church built in 1868 in the Victorian Free Gothic style. It served as a church school between 1868 and 1883, and as a poor school from 1905 to 1927. Between 1932 and 1938 it housed the Kursaal Theatre. 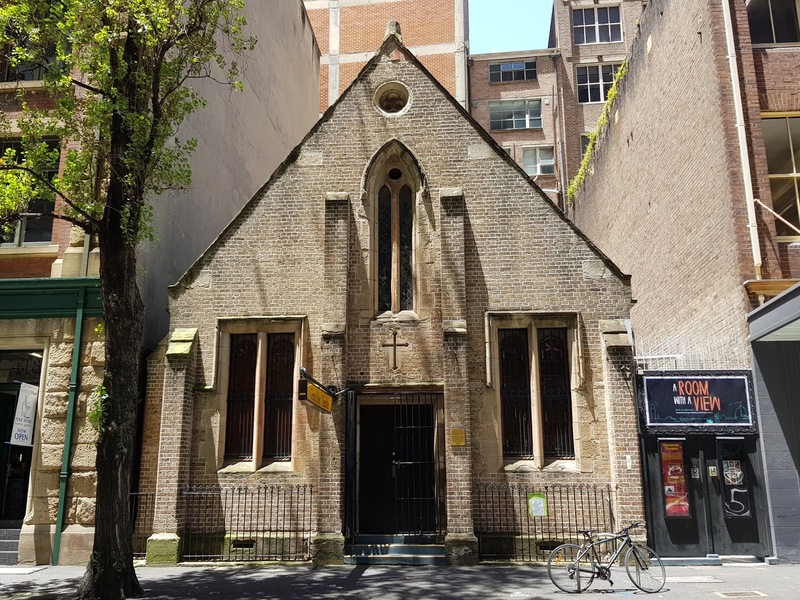 The St Vincent de Paul Society then used the building as a refuge for destitute men, the Matthew Talbot Hostel, until 1952. It then became the Genesian Theatre. Fine looking building surrounded by taller ones. Glad this old church has found a new, useful life. What a nice looking building! I remember performing there in a school drama competition on 1964. Our cast won. That's interesting. Thanks for sharing that, Jill. It has a lot of character. A very nice building with a filigree fence. ...it's nice that it isn't a coffee shop. Mine is also called St. John the Evangelist today! This building is very interesting and a beautiful monument. Great looking building. Thank you for sharing its history.